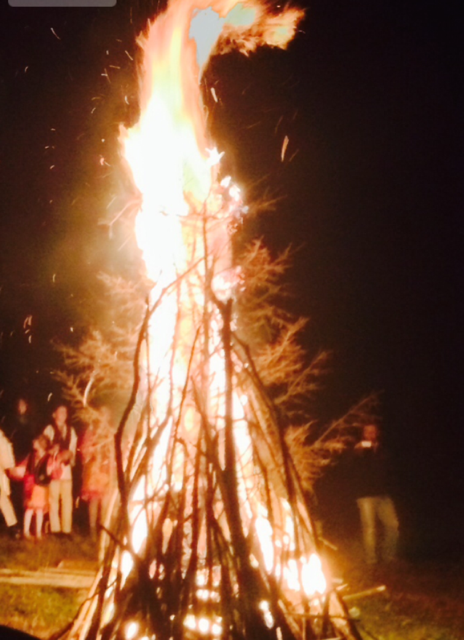 Sumedru’s fire in Sirnea – come and join the autumn festivities in one of the prettiest villages in the Carpathians. While most of Europe burns festive fires on Midsummer’s Night, Romanians of the Bran-Moeciu area do things differently and celebrate their Bonfire Day in late October. 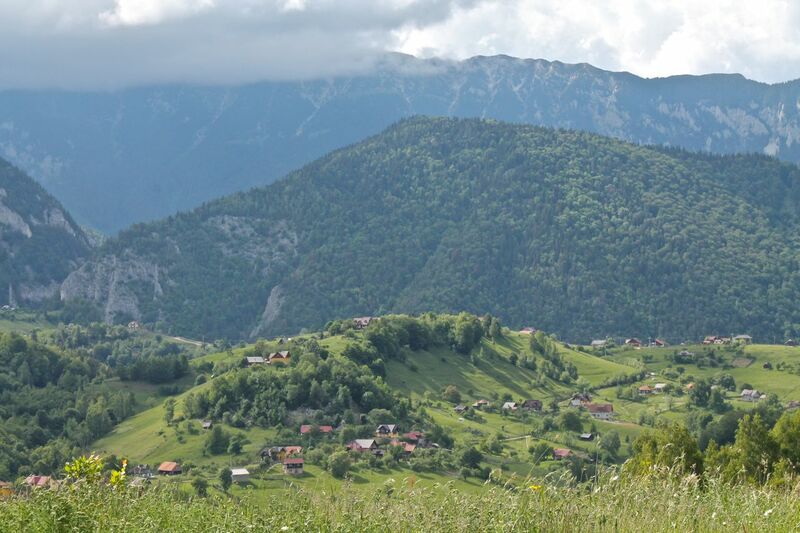 Not a bad decision, we say: all work in the fields is done, sheep are back in the villages, shepherds are back with their children and wives, huge piles of local cheese and dried meat are prepared and palinca (local strong alcohol) is distilled for winter. Time to party! Winter is coming: it’s time for Sumedru’s fire (Jim Morrison would be proud). The ‘funerary pyre’ of the dead summer purifies everyone around it: dancing and singing children, old folks with boxes full of homemade pastries and chocolate bars, flirting teenagers with torches, daring youths leaping through the flames, locals and tourists. The fire is usually built on a high hill so everyone can see it. The celebration may last well into the night with concerts around the fire and late festive dinners afterwards at someone’s house. Visiting any of the Nine Villages on Sumedru’s night offers charming surprises: last year we attended the night celebration in Sirnea village, where local school professor Radu Fruntes organised a great concert with local children lighting the fire, singing and dancing. Later there was a huge party at Radu’s house with hot wine, authentic shepherd-style food and treats and long talks about life with the local police and the mayor. This year we’re going to Sirnea village again to charge our batteries with authentic Carpathian earth energy, and enough good food to survive the long fast until Christmas. Would you like to join us in Sirnea? the evening is Saturday 25th October, but we’ll confirm other information (how to get there, where to stay, what to bring etc) as soon as possible. Leave a comment here, or send us an email with your contact details and we’ll be in touch soon. Please note: this is a traditional and local event, unlike the big commercial thing happening in Bran, so there will be a limit on how many can come to Sirnea. Let us know you’re coming as soon as possible See you there! 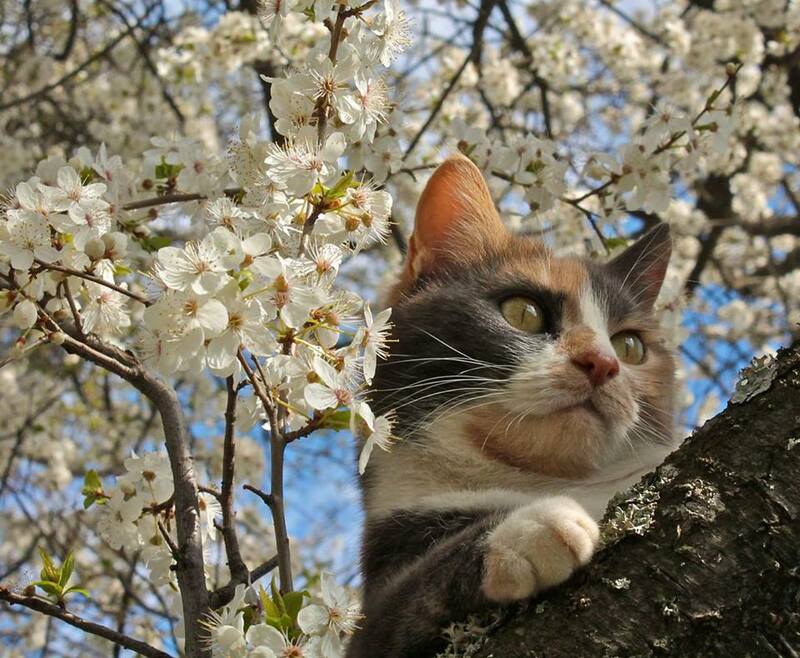 Hobbs the mountain cat takes a nano-second’s rest in her Spring leaping among the blossom. The mirabel (corcodus) trees in the garden are in full flower, with bees and other insects going mad with spring fever. It’s infectious: the cats spend a lot of time in the air at the moment, feet touching ground (or branch) only rarely as they fly about in the April sunshine. There has been a long collective sigh of relief at the two weeks of rain we’ve had this month, and as far as I’m concerned I’d be happy for the rain to continue all summer. Two years of drought, long hot summers that run till October and the first shock of snow, have been tough on a dairy culture that relies on plenty of rain and vigorous growth of knee-high wildflowers in the meadows. I love sun, and the long summers have been wonderful, but the water running out in October is no fun especially when the snow comes in December along with plummeting temperatures and frozen pipes. Worse is the drastic drop in the hay crop which means that sheep and calves face autumn slaughter rather than winter starvation. But this June, the wildflowers are knee-high, the fruit is swelling on the trees and veg springing up in the village gardens. It’s fabulously green, and long may the rain continue, especially if we get bursts of sun between showers. Watch out for loonies leaping between thunderbolts and ssinging in the downpours. The cockerels are announcing the coming of Spring, and with new lambs heralding the beginning of life in the fields and woods around us, we can be sure that Mother Nature is busy. Even though it doesn’t feel like it… Like Britain, Romania is still in the grip of a winter that doesn’t want to let go. It keeps snowing and melting, snowing and melting, and the winds blow, and the clouds lower. Work must begin on the vegetable gardens and the pastures, but it’s hard in the zero degree temperatures. But this is what is around the corner – blue skies, wild flowers, life green, fresh and colourful. We can’t wait!